The best way to understand this election is as a clash of decades. You could shout yourself hoarse arguing what the just-begun 2016 general election is about. The insider versus the outsider! No, feminism versus machismo! No, “Stronger together” versus “I alone can fix it”! One thing that 2016 really isn’t about is newness. Neither candidate is anybody’s idea of a fresh face. Hillary Clinton will be 69 on Inauguration Day, Donald Trump, 70. Each entered this race a celebrity minted in a distant epoch from which neither candidate can fully escape. What’s the 2016 election really about? The Eighties are running against the Nineties. Even in a tumultuous and norm-defying campaign, Clinton and Trump have held fast to the identities they crafted in their formative decades. Truthfully, the two candidates don’t work very hard to update their images because the decades that hatched them represent golden ages to which they promise America will return. Clinton’s New Jerusalem, meanwhile, looks very much like the 1990s. Hillary’s new “Change-Maker” slogan is an echo of Bill’s rallying cry at the 1992 convention: “It’s time to change America.” In May, Hillary said she would put Bill “in charge of revitalizing the economy,” a role that would make him the most powerful first relative since Robert F. Kennedy. The politics are a bit tricky. Hillary knows that Democrats feel ambivalent about resurrecting a public figure whom opponents once branded “Slick Willie.” But she also knows that nobody is ambivalent about the eight-year economic expansion that Bill Clinton presided over during his presidency. “You know, at the end of the ’90s,” Hillary said in March, “we had 23 million new jobs. Incomes went up for everybody.” Elect me, Hillary was saying, and we’ll make it happen again. In theory, one party (call them the Ins) always stands for continuity while the other (the Outs) always stands for change. As a Republican, Trump is obliged to disparage Obama. Trump sees the Obama presidency as a “total disaster,” to quote a phrase he’s used to describe the Affordable Care Act and Obama’s foreign policy. But Trump’s disparagement doesn’t stop there. He uses the same phrase to describe fellow Republican George W. Bush’s conduct of the Iraq war and Bill Clinton’s signing of NAFTA. That takes the 21st century off the table and also the final decade of the 20th. To avoid “total disaster,” Trump’s followers must travel in time back to … you guessed it, the 1980s. Clinton speaks favorably of Obama, as she must; he’s her party’s incumbent, and she spent four years as his secretary of state. But she tends to describe Obama’s administration as a mere continuation of her husband’s (interrupted by a George W. Bush presidency that “wrecked the economy”). The Affordable Care Act, for instance, “was called Hillarycare,” Hillary said in January, “before it was called Obamacare.” That’s a stretch—Obamacare resembles Hillarycare only in the very broad sense that both were ambitious health reform plans proposed by Democrats. But in Clinton’s telling, the biggest policy accomplishment of the Obama administration—really, the biggest policy accomplishment of any Democratic president since Lyndon Johnson—was rooted in the glorious 1990s. Much as they might focus on up-to-date topics like ISIL and cyberwar, Trump and Clinton are vying for control of the political Wayback Machine, and the only difference is where they want to set the dial. Want to know what they’re likely to do in office? Just take a look at the signature themes—war, economy and good old family values—that define the eras that they epitomize. Broadly speaking, the 1980s was a decade of peace and the 1990s a decade of war. That confounds political stereotypes because Ronald Reagan was a bit of a saber rattler. “I've signed legislation that will outlaw Russia forever,” Reagan famously quipped in 1984, not knowing the microphone in front of him was hot. “We begin bombing in five minutes.” Reagan presided over a vast arms buildup, including a wildly ambitious anti-nuke umbrella in outer space that critics dubbed “Star Wars.” Some historians credit this arms buildup with winning the Cold War simply because the Soviets couldn’t keep up. Reagan also aided proxy wars in Nicaragua, Afghanistan and elsewhere. The real wars happened in the 1990s. The largest deployment was 1991’s Persian Gulf War, wherein U.S. forces chased Saddam Hussein out of Kuwait (but not out of Iraq). The Gulf War was a 1990s event but not a Clinton administration event; it was waged by George H.W. Bush, and it rekindled, however briefly, Americans’ faith in full-scale military intervention after their Vietnam debacle. (“Good night, Vietnam,” reporter David Shribman quipped in the Wall Street Journal). Bush also committed troops to support relief efforts in Somalia, where civil war was raging. Clinton escalated that deployment and then withdrew the troops as the country descended into anarchy. Later in the ’90s Clinton ordered airstrikes to quell ethnic strife in Bosnia and Kosovo, and also twice in Iraq to counter assorted misbehavior by Saddam. Trump’s foreign policy stance is an exaggerated version of Reagan’s: Talk tough and go out of your way to avoid military interventions. Except for Somalia, all these military operations were on balance successful, and all of them, including Somalia, were short term. In both respects, they were vastly different from U.S. deployments over the following two decades in Iraq and Afghanistan. Trump is much fonder of Russia than Reagan was (to put it mildly), but otherwise his foreign policy stance is an exaggerated version of Reagan’s: Talk tough (“I’m gonna build a military that’s gonna be much stronger than it is right now,” Trump has said.) and go out of your way to avoid military interventions. Did Reagan provoke the Soviet Union by calling it (however accurately) an “evil empire”? Trump sees and raises by endorsing torture (“We have to beat the savages.”). Although at the time, Trump favored the 2003 Iraq invasion and the 2011 U.S. intervention in Libya, just as Clinton did, he now says he opposed them. Clinton, meanwhile, is more measured in her rhetoric but favors a more hawkish foreign policy that’s closer to the 1990s policies of George H.W. Bush and her husband. As secretary of state, for instance, she favored U.S. training for Syrian rebels, only to be overruled by Obama. The 1980s was a decade in which the budget deficit spun out of control. The 1990s was a decade in which the deficit, however briefly, disappeared. Here again we see Republicans and Democrats playing against type. “For decades we have piled deficit upon deficit,” Reagan said in his 1981 inaugural address, “mortgaging our future and our children's future for the temporary convenience of the present.” When he spoke these words, the budget deficit was $74 billion. By the time Reagan left office it was $155 billion. (Currently the deficit is $401 billion, a higher absolute figure but a smaller percentage of gross domestic product than in Reagan’s final year.) Much of the blame lies with tax cuts that failed to deliver the revenue boost predicted by the supply-side economic priesthood. But federal spending increased during Reagan’s presidency, too, by about 80 percent, much of it the aforementioned military buildup. The deficit continued to climb during George H.W. Bush’s presidency, but under Bill Clinton it fell from $290 billion, to zero, to a surplus of $236 billion in Clinton’s final year. Tax increases passed by Clinton and by Bush (in violation of the latter’s “no new taxes” pledge) helped bring deficits under control, but Clinton also slowed spending growth. During Clinton’s presidency, federal spending increased by 29 percent—less than half the rate of increase under Reagan and slightly slower than Obama’s estimated 32 percent. Trump makes less effort than Reagan did to disguise his hedonistic impulse toward deficit spending. Most government expansion over the past few decades, it should be noted, has occurred through contractors. Nobody, alas, seems to know how many contract employees that entailed, but it’s a good bet their ranks grew through both the 1980s and the 1990s. According to the Congressional Budget Office, federal contract spending today is somewhere in excess of $500 billion. Most of that spending is by the Defense Department, which today, remarkably, hands most of its annual budget over to the private sector. As with matters of war and peace, Trump’s stance resembles Reagan’s, with the difference that Trump makes less effort than Reagan did to disguise his hedonistic impulse toward deficit spending. “You have tremendous waste, fraud and abuse,” Trump told the Wall Street Journal in February, invoking a trinity frequently mentioned by Reagan in the 1980s. But the specific example Trump gave—phantom Social Security payments to nonexistent people aged 106 years and older—garbled an inspector general report that actually said very few such payments were made. In general, Trump distinguished himself from his primary opponents by pledging not to cut entitlement spending even as he proposed tax cuts that the bipartisan Committee For A Responsible Federal Budget estimated would expand the national debt by $12 trillion. Hillary’s orientation is very much like Bill’s was in the 1990s—she does not espouse entitlement cuts (Democrats seldom do) but would likely accept them as part of a bipartisan budget deal that also raised taxes (though she’s never said so). Clinton has proposed new government spending that might add up to as much as $1 trillion, but her proposed tax increases would raise about the same amount, according to the left-leaning Tax Policy Center. On paper, then, Trump would expand the deficit, as Reagan did in the 1980s, while Clinton would neither expand nor shrink it, falling short of what Bill achieved in the 1990s. The 1980s celebrated family values. The 1990s fretted about them. Ronald Reagan was the first (and still the only) divorced person ever to be elected president. But even his bitterest enemies didn’t question Reagan’s devotion to his wife Nancy. Some did think, though, this devotion verged on dependence: He called her “mommy,” and once, in 1984, she got caught on tape feeding him a response to a reporter’s question (“We’re doing everything we can.”). The Reagans’ daughter, Patti Davis, thought her parents’ devotion to each other “meant that they were complete” without their children. “If a band of gypsies came and took me and [Ron Reagan Jr.] away,” Patti said earlier this year on NBC’s Today, “they would miss us, but they’d be fine.” After Reagan’s first grandchild was born, it was noted widely that the sitting president took two years to see him. Reagan avoided the subject of gay rights, even though, as a former actor, he had many gay friends (prompting the liberal commentator Hendrik Hertzberg to dub him a “closet tolerant”). Reagan didn’t mention AIDS publicly until 1985, and when the topic came up at news briefings it prompted snickers. The topic of gay marriage lay far enough in the future as to be a non-issue; as late as 1989, mainstream culture judged it an entirely novel idea when the conservative writer Andrew Sullivan published his first essay on the topic. On abortion, Reagan was a sharp critic, even going so far as to write an election-year book in 1984 titled Abortion And The Conscience of A Nation. Through the 1980s, teenage birth rates, teenage pregnancy rates and teenage abortion rates stayed about level. In the 1990s, Bill Clinton showed himself to be a more doting father than Reagan—we learned last week he binge-watched all six Police Academy movies with Chelsea—but a less doting husband. Evidence of the latter trickled in during the 1992 primaries (prompting a Clinton campaign aide to coin the phrase “bimbo eruptions”) and turned into a flood in 1998, when an independent counsel hired to investigate a fishy-looking real estate deal decided instead to pursue Bill’s commitment to (and veracity under oath concerning) his marriage vows. In the 1990s, Bill Clinton showed himself to be a more doting father than Reagan, but a less doting husband. Trump, like Reagan, is in his personal life a (somewhat-less-closeted) tolerant: a twice-divorced man who during his first marriage began an affair with the woman who would become his second wife. Unlike Reagan, though, Trump lacks gallantry; he once boasted in writing that “If I told the real stories of my experiences with women, often seemingly very happily married and important women, this book would be a guaranteed best-seller.” On social issues, Trump hews closer to Hillary Clinton than to his fellow Republicans, opposing, for instance, North Carolina’s ban on transgender bathrooms. But Trump’s attitudes on gay and transgender rights have been somewhat conflicted over the decades. He shunned his longtime mentor and lawyer Roy Cohn in 1985 when he discovered Cohn had AIDS, which he would die of in 1986. On the one hand, in Trump’s nomination speech he diverged from his text to congratulate the crowd for cheering his pledge to “protect LGBTQ citizens from the violence and oppression of a hateful foreign ideology.” On the other hand, Trump draws the line at gay marriage and abortion, both of which he now opposes. Hillary Clinton favors gay marriage and is pro-choice. Democratic officials have low expectations about the prospects for constructive dealings with Vladimir Putin. While Obama and Clinton ridicule Trump's vow to "get along great" with the Russian leader, the administration is quietly trying to open a dialogue of its own. Donald Trump was the bogeyman of this week's Democratic national convention. But placing a close second to Trump was Russia's President, Vladimir Putin. Democrats linked the two bad guys together, hammering Trump for his past words of praise for Putin as a "strong leader" and his claim that the U.S. would "get along great" with Russia if he is elected. But just the day before, on Tuesday, Secretary of State John Kerry sat down with Russia’s foreign minister, Sergei Lavrov. On their agenda was a U.S. proposal to cooperate with Russia in Syria, which he presented in a meeting with Putin at the Kremlin earlier this month. And on Thursday, a senior Obama administration official reminded a national security conference that better relations with Moscow, something Trump has been criticized for saying would be “a great thing,” remains a core goal of U.S. foreign policy. To be sure, Obama officials have low expectations about the prospects for constructive dealings with Putin, who has pursued an aggressive foreign policy while clamping down on dissent at home. They are also outraged by what they believe to be a Kremlin's hand in the cyber theft and release of Democratic National Committee emails. (Kerry sternly raised the issue with Lavrov on Tuesday, U.S. officials said.) And Slotkin made clear that Washington’s offers of dialogue are part of a “balance” that includes military muscle-flexing and steps like recent U.S. reinforcements of NATO’s eastern flank. “We have to have a twin deter-and-dialogue message,” Slotkin said. Sterling’s devaluation and an expected slowdown in UK car sales would cost Ford $200m this year and another $400m to $500m each year over the next two years, said Shanks. “We’re going to have to look more at cost,” he said. The company would find a way to “claw that back”. Shanks’ comments are likely to stoke further fears about the fate of the UK car market in the wake of Brexit. Trade deals will now have to be renegotiated with the rest of Europe leading some analysts to speculate car firms may delay or cancel plans to expand in the UK or quit altogether. Ford has two remaining manufacturing plants in the UK, at Dagenham and Bridgend. Asked if the group would shut its remaining UK manufacturing operations after Brexit, Shanks said: “Everything is going to be on the table across Europe”. Ford’s net income fell 9% to $2bn in the second quarter as the company’s China sales weakened and the company failed to match better results from last year. The company has bounced back from near collapse during the recession. Its operating profit for the first half of the year was a record $6.8bn. But as business appears to slow, its success has led to tough comparisons for the company. Ford, which has previously announced that it expects to make a pretax profit of $10-$11bn this year, acknowledged that this guidance is at risk as China’s economy slows and the ramifications of Brexit become clearer. “We’re seeing elevated economic risk for the most part globally, and particularly, in what is happening with Brexit,” Shanks said, speaking to reporters at the company’s headquarters. For the quarter Europe, which has long been a dark spot for Ford, outperformed with sales rising 11%. Pretax profits in Europe almost tripled to $467m thanks in part to stronger sales in Russia. In North America sales were flat from a year ago and Shanks said that Ford’s record-breaking recovery in the US had plateaued. “We don’t see growth, at least in the near term,” Shanks said. The company lowered its estimates for full-year industry sales in the US and said next year’s sales will be even weaker. In Asia, Ford recorded its first pretax loss of $8m in more than three years. Shanks said Ford sold fewer commercial vehicles in China and spent heavily on engineering and warranty costs. The weaker yuan also impacted sales of its luxury Lincoln brand. Ford’s losses in South America also more than doubled to $265m because of continuing economic issues in the region. The profit, of 52 cents per share, compared to a profit of 54 cents per share in the April-June period year ago. That missed Wall Street’s expectation of a profit of 60 cents per share, according to analysts polled by FactSet. Revenue was up 6% to $39.5bn. Automotive revenue of $37bn beat analysts’ expectations. Ford sold 1.7m vehicles during the quarter, which was flat from a year ago. Ford’s automotive operating margin fell from 8.4% in the second quarter last year to 7.7% this year. Its North American operating margin fell from 12.2% to 11.3%. The charisma-challenged candidate had been around for a long time, but never established a rapport with the national electorate, struggled to articulate a vision for the future of the country, and lacked any natural rhetorical gifts. Democrats gathered in Philadelphia for Hillary Clinton’s nomination compared her challenges to those of Bush Pere, a politician known for plodding pragmatism who was running on a platform of relative continuity with the Reagan administration that graduated him. But at his convention, Bush handily dispatched with the notion that he suffered from a “wimp factor” and the persona of an insensitive patrician — and it had a lot to do with that speech. On Thursday night, the finale of a Democratic National Convention that helped unite the party for the upcoming fight against Donald Trump, Clinton faces a similar kind of test and opportunity when she takes the stage. Like Bush 20 years ago, Clinton must change baked-in perceptions that she lacks authenticity and vision. And she must give America a better sense of who she is when she’s not playing the politician and why she can be trusted to keep her promises. The former secretary of state's campaign was seeking a part for Sanders in the roll call vote as a healing gesture after a bruising primary. Hillary Clinton is minutes away from breaking a historic barrier and becoming the first woman nominated for president by a major political party in the United States. Yet her team spent the final hours before her momentous achievement negotiating intensely with her top rival, Bernie Sanders, to prevent an embarrassing display of resistance on the floor of the national convention. Even as delegates began voting to select their nominee, Clinton's aides were furiously working to expand Sanders' role in the day's proceedings, a move they hoped would continue healing the wounds ripped open by a divisive primary season. Among the considerations was permitting Sanders to cancel the roll call vote and move to nominate Clinton by a voice vote. It was the same process Clinton used to nominate Barack Obama in 2008 and signify unity after their own bitter primary. In homage to the groundbreaking moment, Clinton had arranged for Maryland Sen. Barbara Mikulski and Georgia Rep. John Lewis, a civil rights icon, formally nominated Clinton for president. "We have come to far, we have made too much progress, and we are not going back. We are going forward," Lewis boomed. The Vermont senator was inside Philadelphia’s Wells Fargo Center as the roll call vote began, but it remained unclear exactly what part he would play in the proceedings. His name was entered into nomination by Hawaii Rep. Tulsi Gabbard, who marveled at how the "frumpy" and "grumpy" septuagenarian connected with young and diverse voters. "Because this is a movement fueled by love, it can never be stopped or defeated," she said. The room erupted in sustained cheers. The GOP isn’t the only party having an identity crisis in outsider-friendly 2016. We asked six big thinkers to sit down and hash it out. In June, when Politico Magazine convened six Democratic thinkers at The Monocle, the storied Capitol Hill restaurant, the mood in the room was surprisingly upbeat. It was exactly one year after Donald Trump had announced the against-the-odds campaign that by May would see him anointed the Republican Party’s presumptive presidential nominee. Now, the candidate appeared to be flailing, criticized for his latest inflammatory comments about the Orlando shooting and the Mexican origins of a federal judge. For the Democrats, the general election was starting to look more and more winnable. Then again, it was also just 10 days since Hillary Clinton had finally become the Democrats’ presumptive nominee after an unexpectedly hard-fought primary. Clinton’s insurgent challenger, the septuagenarian socialist Senator Bernie Sanders, not only held on much longer than anticipated (and was still hanging on at that point in June, if in name only), but also went to war with the Democratic Party itself, declaring its leadership in the tank for his “establishment” opponent. That leadership—along with President Barack Obama—has been accused of letting the party languish at the state and local level, where Republicans are ascendant. Meanwhile, both the Sanders and Trump campaigns exposed severe weaknesses in the Democrats’ ability to appeal to white working-class voters, the same ones who in past elections were key supporters of Bill and Hillary Clinton. Where does the Democratic Party go from here, and what will it look like years from now? Can it win back the white working class? Should the party even try to—or is it better off embracing diversity in a country on its way to being majority-minority? These are just some of the questions Politico Editor Susan B. Glasser and chief political correspondent Glenn Thrush asked the six smart thinkers we called together last month— Democratic campaign veterans, writers and one sitting Cabinet member—for a spirited conversation about the future of their party. Susan Glasser: Today marks exactly one year since Donald Trump entered the presidential campaign, upending certainly the credibility of all political pundits, but in addition to that, really making this, whatever the outcome, an election year for the record books. My guess is that this election season will have consequences that are no less significant for the future of the Democratic Party than for the Republican Party. So, what do you think about where the Democratic Party is headed in the age of Donald Trump and Hillary Clinton? Michael Kazin: Democrats got very lucky with Trump because—I mean, who knows what would’ve happened with Marco Rubio, but clearly Republicans would’ve been doing much better in the polls right now. But having Trump there makes Democrats think that they haven’t really got a problem, which—I think they still do have a problem. They have since the ’60s, in many ways, which is: They have intellectual, upper middle-class well-educated people, and they have black people and Latinos. And the broad middle is still up for grabs. Democrats have not found a way to win those people over in any kind of convincing way. And Trump has made it easy for Democrats to run against him, but they haven’t yet figured out how to run for themselves. Glenn Thrush: You’ve got a guy here, Mitch Stewart, who was one of the architects of Barack Obama’s elections. Do you agree with that assessment of the broad middle? Mitch Stewart: No. So if you just look at the numbers, this notion that Democrats have to overperform with whites isn’t backed up by the data. So in 2008, 26 percent of the electorate was non-white. In 2012, 28 percent was nonwhite. In 2016, it will probably be 30 or 31 percent nonwhite. We’re going to be a majority-minority country in 2050. And so that trend isn’t slowing down or plateauing. It’s actually relatively linear, and it’s pretty easy to predict. Tanden: That issue is actually something that’s driving Trump, but also that Democrats have to figure out a response to, which is: The most salient thing in the Republican primary that separated Trump from other Republicans was a sense that whites were losing out. So I do think the Trump phenomenon is a response to two trends. One is an economy that has not been producing good results for the white working class, and also a country that’s becoming more and more diverse. I think that the idea that we’re going to have—it may only be 30 or 35 percent—truly angry people going forward in the United States is actually going to alter our politics. I think Hillary will win this fall, but it’ll alter our politics for some time. E.J. Dionne is a columnist for the Washington Post, senior fellow at the Brookings Institution, professor of government at Georgetown University and author, most recently, of Why the Right Went Wrong: Conservatism—From Goldwater to the Tea Party and Beyond. Anita Dunn: Trump is, to some extent, redefining what we think of as polarization in this country. Where polarization has been seen as ideological, it is now being seen almost as behavioral. (Laughter.) No, seriously, though. Neera talked a little about the angry white voter appearance of “that’s who supports Trump.” I actually think Trump’s support is a little more nuanced than that with some people. Dunn: They are men. But I think that what he is doing is, his campaign has been basically issueless with a few exceptions, immigration and trade—that he’s actually taken polarization much more toward attitudes than toward ideological gridlock. And I think that Neera’s right that because he’s dragging his party so far in one direction along that spectrum, that it creates a new center. And that new center actually is farther along than it has been in the past. When you have an extreme, it creates a new center. And you’ve got an extreme here. Kazin: What’s the content of it? Dunn: OK, so here is the deal. Has anybody else been struck at the language that mainstream establishment Republicans have been using since the Orlando shooting to talk about the LGBTQ community and rights and how we have to stand with our brothers and sisters? This is just not something that they have been comfortable talking about. But suddenly with Donald Trump far over here, everybody’s comfortable being in the middle here on that issue, right? And that, to me, has been extraordinary. Tanden: They’re more in the middle because of him? Thrush: Because he’s pulled it away from ideology and into attitude. On the epic spectrum of bad publicity that has defined Donald Trump’s volatile, attention-snatching campaign, Melania Trump’s plagiarism of parts of a Michelle Obama speech on the first night of this week’s Republican National Convention was relatively tame. The advice from seasoned professionals was pretty simple: Find someone to fire, let the scandal die down, move on. Instead, clumsy and contradictory excuses from staffers and surrogates helped keep the story alive all day Tuesday. By Wednesday morning, with the gaffe still dominating the news cycles, the boss had had enough—enough apologizing, enough flailing attempts at standard crisis management. It was time for Trump to declare victory. This seemed like a preposterous claim—that borrowing lines was basically a good thing if it got enough attention, that all the fumbles that kept the topic in the news were just part of a story of success. But the idea, unprecedented at this level of politics, is at the heart of one of the most remarkable mechanisms of Trump’s rise—the conviction that mistakes, flagrant provocations and the attendant bad publicity genuinely don’t matter, so long as they serve the goal of owning the spotlight. On the short list of Trump’s most guiding, abiding beliefs, this is one that ranks near the top: that bad publicity doesn’t have to be avoided, and doesn’t have to be endured—that it should be embraced, and even stoked. It’s possible to see Trump’s whole campaign as a structure built on colossal missteps, statements that would have torpedoed all other candidacies but have buoyed Trump’s simply by keeping his name in the news. Trump launched his presidential candidacy last summer by descending the escalator at the tower that bears his name and uttering his infamous words about how Mexico is sending to America its criminals and rapists. Those remarks alienated an ally, trashed a major portion of an ethnic group Republicans had vowed to court and set the tenor for a bid that has willfully, almost gleefully defied every poll-tested tenet of modern politics. Calling Senator John McCain “not a war hero” last July was another early signal that he would go out of his way to make trouble, and benefit from it: The disrespectful comment earned Trump widespread condemnation—and a surge in polls. Since then, from his mocking of a disabled reporter to his declaration that he could shoot somebody on Fifth Avenue and “wouldn’t lose voters” to his grinning, thumbs-up Cinco de Mayo social media taco bowl blast—“I love Hispanics!”—to his suggestion that the judge in a Trump University class-action lawsuit couldn’t be impartial due to his Mexican ancestry to his pigheadedness in the Star of David controversy, bad publicity hasn’t torn him down. It consistently has kept him in the public eye, and kept his opponents scrambling for attention. If that belief has seen its most high-stakes demonstration over the past 13 months, it has for Trump a much deeper, more personal history. And if it’s possible to identify the moment when the tactic was first on full display, it was February of 1990—a month in which Trump’s scandalous affair with the buxom actress Marla Maples destroyed his marriage with the former Ivana Trump, the mother of his first three children. In the mind of nearly every business and public relations expert in America, such an event was a damaging crisis to be buried posthaste; the frenzied coverage of his congenital intemperance and incorrigible megalomania, they thought, obviously would tarnish Trump’s brand. In the mind of Trump, on the other hand—as he watched his name and photograph jump from the New York tabloids to the national news, day after day, week after week—the nonstop exposure was a tool to enhance his celebrity on a vast new scale. Trump was right. The experts were wrong. And the approach that came into focus more than a quarter-century ago hasn’t changed. More than any Oval Office aspirant ever, Trump the candidate hasn’t managed bad publicity so much as he has turned it into a weapon. But this philosophy, and his skill deploying it, now faces its stiffest test. What really knocked the plagiarism episode from the headlines this week was an even bigger piece of bad PR—the spectacle of a stalwart of his own party, Ted Cruz, standing in front of the Republican crowd, refusing to endorse Trump, pointedly and in prime time. In background chats with GOP operatives and delegates around Cleveland, the refrain was consistent: The Trump campaign must be operating under the theory that the most important thing is sheer publicity, good or bad. Trump leaves the convention, though, as the official nominee of a party that still hasn’t united behind him, many of its members seeing as disqualifying his suspect conservatism, his ceaseless missteps and his overall disposition. In the months to come, too, he will be raked by an ongoing onslaught of Democratic attack ads, the fodder for which is the mass of material that generated the bad publicity he has turned into fuel—the bad publicity he has used to get to the brink of residence in the White House. But his unfavorable ratings are historically high. He sits at zero-percent support among black voters in swing states Ohio and Pennsylvania. He has well-documented meager support from Hispanics and from women. If bad publicity is partly what helped him run through the primaries, it is also, analysts contend, what finally will stop him over the next three-plus months heading into the general election. November 8 is shaping up to be a referendum on a question Trump has pressed to its limits. “We’ll know,” Hartman told me, “on Election Day. Liz Smith, the gossip columnist for the New York Daily News, broke the story on February 11, 1990, on a Sunday, on the front of the fattest paper of the week. “The marriage of Ivana and Donald Trump seems to be on the rocks,” she wrote, “and inside sources say lawyers are already at work trying to divide the complex Trump holdings.” Reports of Maples, the model and actress Trump had ensconced in a suite at the St. Moritz, and the size of the payout of the prenuptial agreement were on their way. The flood of headlines came fast. Now, faced with a potentially embarrassing personal scandal, would he clam up? Hand off the task to a high-priced, top-flight public relations firm? No chance. Trump—at the time, the riding-high, 43-year-old builder of Trump Tower, the owner of the Trump Shuttle airline, the Trump Princess yacht and two and soon to be three Trump-branded Atlantic City casinos—mostly did it himself. “I am leaving because I want to leave,” Trump told the News one day in. “What do you mean?” Trump responded. To PR experts, that was crazy. They thought he was doomed. A man who had crafted a widely known personal luxury brand had been exposed as an undisciplined adulterer, and more sober financial analysts and reporters had started to pick up hints that his corporate record, too, was about to be shown as a sham. To Taylor, Trump didn’t seem like a man too troubled by the tabloid titillation. Not everybody saw it that way. A full seven days in—February 18, 1990, the second Sunday of the story—the News reported on the results of its “Trump Wars Telephone Poll.” Readers of the paper overwhelmingly sided with her, not him, “by a margin of more than 4 to 1,” said the News. Also that day, on the 15th page of the business section of the Times, there was a totally different, much less splashy headline: “Rocky Times for Trump’s Bonds.” “Trump’s mortgage-bond issues have fallen so far in the past several months that Salomon Brothers, the Wall Street bond house, recently advised its institutional clients to sell the bonds issued for Trump’s Castle casino in Atlantic City casino,” Diana B. Henriques reported. Analysts warned the bonds’ shaky state could be exacerbated by the opening of the Trump Taj Mahal—Trump’s third casino—which was scheduled for early April. It was one of the first indications in ink that his business empire was actually a debt-burdened, panting-for-profit, smoke-and-mirrors show. Barely anybody noticed. But he kept talking to reporters. He kept taking their calls. He kept answering their questions. One reporter from the Post asked if he considered adultery a sin. “I don’t think it’s a sin,” he said, after half a minute of silence, “but I don’t think it should be done.” Had he done it? “I’ll let you guess,” Trump said. And he kept talking about how all “this negative publicity,” as he put it to the Post, was helping his business, not hurting it. “Business has never been better,” he told the Associated Press. Ten days after the story broke, the New York Society of Association Executives hosted Trump at a luncheon to give him an award as the “Outstanding New Yorker of the Year”—this was on the schedule before the hubbub—and Trump got up in front of an audience of the group’s 750 members and a horde of press. Others weren’t smiling. Critics clucked. “It is going to be hard to view Mr. Trump as a prudent individual,” corporate identity expert Clive Chajet said in the Times. Even Liz Smith, the doyenne of attention, access, gossip and celebrity, figured this was too much. In her column two weeks post-LOVE ON THE ROCKS, she tried to take stock of the madness. “I once wrote a flattering and, I thought, truthful evaluation of Donald for New York magazine,” she wrote. “I said I thought (I hoped) one day he’d get over his youthful immaturity and build low and middle-income housing and maybe get into a better form of philanthropy. I opined also that he might one day be President. “I pointed out that Donald didn’t want to have to think seriously right now about the needs of others while he was busy empire-building,” she continued. “And he was satisfied to do only superficial charity giving. He congratulated me at the time for my ability to size him up. By early 2004, the Trump playbook for bad publicity was battle-tested. Trump Hotels and Casino Resorts, his casino company that hadn’t turned a profit since it went public in 1995, filed for Chapter 11 bankruptcy. Shareholders noticed. Few others did. Instead, most people followed along as Trump played the boss on the year’s breakout reality TV show, The Apprentice. The way he talked evoked the 1990 sit-down with Taylor from New York. The bankruptcy didn’t seem to bother Trump, but it did others. “This shows that the Emperor may not have that many clothes on,” Fraser Seitel, the managing director of Emerald Partners and the author of college textbooks on public relations, told the Times. “It doesn’t matter,” Trump told the News. “It’s terrific,” he told Newsday. By early 2011, Trump was weighing whether to run for president in 2012—a longtime publicity ploy of his, dating back to 1987 when he was promoting The Art of the Deal—and here he opted to wade into the rightward fringe of “birther” conspiracy theorists. Trump’s six-week fixation on the zany wedge issue ultimately prompted an exasperated Obama to make public his “long-form” birth certificate to prove he in fact was born in Hawaii. Many considered it an unseemly distraction with upsetting racial overtones. With a certain portion of the populace, though, it upped Trump’s political profile. “I feel I have accomplished something really, really important,” he said in a press conference. He said he was “really proud” of what he had done. Four years and two months later, Trump rode the Trump Tower escalator down into the orange-peach marble atrium and said he was running for president, and that he wanted to build “a great wall,” “a great, great wall,” to keep out Mexican rapists. Trump has done this with such longevity that bad publicity somehow has become a facet of his perceived authenticity. He has done it with such consistency that a lack of bad publicity weirdly would feel like a betrayal to his brand. Experienced, respected advertising and marketing professionals—including some who have worked for Trump—told me there’s never been anybody quite like him, this combination of arrogance, intelligence, obstinacy and manifest incapacity for shame. George Lois is a giant in the ad world. He was the brains behind dozens of iconic covers for Esquire. He wrote books like The Art of Advertising and $SELLEBRITY. And he came to loathe Trump—because he had worked for him. In the mid-1980s, he did some casino ad strategy for Trump, and Trump tried to short him from the agreed-upon pay, Lois told me last week. “I think the guy’s a total scumbag,” he said. In 1990, though, when he was asked whether all the coverage of Trump’s divorce would damage his brand or ruin his name, Lois said ... no. And this is how he got Trump precisely right. Lois, a cynical but sophisticated student of the fame game, saw then what Trump was doing. “Even the Zulus know who he is now,” Lois told Newsweek. Now, finally, he believes Trump has gone too far. Since Trump’s announcement speech, though, he has explored the frontiers of effrontery more boldly than any major candidate in the history of the country—and the “time of reckoning” is TBD. In the primaries, every time Trump did something that spurred another round of bad publicity—the “captured” McCain comments, the Megyn Kelly “blood” comments, calling for “a total and complete shutdown of Muslims entering the United States,” playing dumb when asked to disavow white supremacist David Duke, on and on—overall, his poll numbers went up, not down. And his “pivot” to the general election, that sudden maturation of style from smashmouth into something more sophisticated and presidential, has been nothing of the sort. He became the presumptive Republican nominee on May 3; two days later, the taco bowl tweet. Asked in the middle of that month if he thought voters have a right to see his tax returns, he said, “I don’t think they do.” Asked to disclose his effective tax rate, he said, “It’s none of your business.” That fallout, though, got fogged over by a (welcome) few news cycles fixated on how he used to use a fake name to pose as his own spokesperson. He issued credulity-straining denials. He responded to assiduous reporting about his lying about donations to veterans by attacking the press, knowing that maligning the media would play better than any additional focus on phony philanthropy. He responded to reporting about the Trump University trouble by attacking the judge, knowing that even racial animus would play better than ongoing talk about a venal scheme masked as education for striving Americans. He responded to the June massacre in the gay club in Orlando by bragging on Twitter: “Appreciate the congrats for being right on radical Islamic terrorism.” And earlier this month, in the dying-down wake of the Star of David tumult, he reignited the bad publicity in a speech in Cincinnati by saying he regretted only deleting the offensive tweet and then changing the six-sided star to a circle. “I said, ‘Too bad. You should have left it up,’” he said of a conversation with a campaign worker. “I would have rather defended it.” He blamed the media—“bad people”—for making it a big deal. “Is there such a thing as bad publicity?” asked MIT’s Hartman. Just as it’s difficult to gauge specific reasons for fluctuations in polls—it’s almost always a combination of factors. But Trump now is heading out of Cleveland armed with recent polls that show him gaining on, all but even with or outright ahead of Clinton in critical swing states as well as overall. And the experienced, prominent industry experts and professionals who said bad publicity would hurt Trump—in 1990, in 2004, in 2011—now don’t sound anywhere near as certain. “It may be there is a tipping point at some point,” said Steve Strauss from USA Today. Or maybe not. And Fraser Seitel, who in 2004 called Trump the emperor with no clothes, grasped in our conversation for a way to explain what’s going on. I asked him if he wanted to modify his memorable quote from 2004. “The emperor has no clothes,” he said again. When Tony Schwartz, Donald Trump’s ghostwriter for his 1987 memoir “The Art of the Deal,” decided to tell the public about his concerns that Trump isn’t fit to serve as President, his main worry was that Trump, who is famously litigious, would threaten to take legal action against him. Schwartz’s premonition has proved correct. Greenblatt demands that Schwartz send “a certified check made payable to Mr. Trump” for all of the royalties he had earned on the book, along with Schwartz’s half of the book’s five-hundred-thousand-dollar advance. (The memoir has sold approximately a million copies, earning Trump and Schwartz each several million dollars.) Greenblatt also orders Schwartz to issue “a written statement retracting your defamatory statements,” and to offer written assurances that he will not “generate or disseminate” any further “baseless accusations” about Trump. On “Good Morning America,” Schwartz told host George Stephanopoulos that “The Art of the Deal” very likely contained “falsehoods” owing to the fact that Trump, in his opinion, has a strong propensity to exaggerate and lie. Greenblatt attacks Schwartz’s statement, arguing that if the book is less than accurate, then Schwartz had breached his obligations as the book’s co-author. In response, Schwartz’s lawyer notes that because Trump takes credit for providing “all of the material in the book,” if there are falsehoods they must have been provided by Trump. “Any purported failure by Mr. Schwartz to be ‘accurate in the completion of [his] duties’ would be entirely because of misleading statements by Mr. Trump,” McNamara writes. In his letter, Greenblatt also accuses Schwartz of having tried to profit from his association with Trump after “The Art of the Deal” was published, as Trump had said in a phone interview with me. Greenblatt quotes from a friendly letter that Schwartz wrote to Trump in 1988, soon after “The Art of the Deal” was published, in which he described their “partnership” as “a success in every respect,” and said, “I hope we’ll be able to work together again, on other projects.” Greenblatt does not acknowledge that when Trump asked Schwartz to co-author a sequel to “The Art of the Deal,” Schwartz rejected the offer. Greenblatt’s letter claims that Schwartz has “pleaded with Mr. Trump to provide you with more work.” Schwartz says this is “totally false,” and that he has made no business overtures to Trump during the last twenty-eight years. Asked last night to provide any evidence that Schwartz had ever sought work from Trump after the publication of “The Art of the Deal,” Greenblatt said he could provide none at that moment, but would try to find some soon. Speaking by phone from the Republican National Convention, in Cleveland, he added that “Mr. Trump is a bit busy tonight,” so would not be available to back up his allegations with any specifics, either. Instead, he cited Schwartz’s agreement, earlier this year, to a plan to issue an audio version of “The Art of the Deal.” (Schwartz has pledged to donate all royalties from the book in 2016 to charity.) Other than that, Schwartz reiterated to me that he has had almost no contact with Trump, and until a few months ago had kept almost silent about him. The conservative bomb-thrower reminds the GOP he’s not in it to make friends. CLEVELAND — Ted Cruz just out-Trumped Trump. Turns out that when you bully a guy for months, suggest his wife is unattractive, insinuate that his dad participated in the JFK assassination, call him “Lyin’ Ted,” dispatch your bouncer-like emissaries to coerce an endorsement, then give him a prime-time speaking spot on the third night of your nominating convention — well, you get the picture. Audacity is supposed to be Donald Trump’s most valuable attribute, but it was Cruz who delivered one the most audacious blows of the 2016 campaign, pointedly refusing to endorse his party’s nominee even as an incensed audience at the Quicken Loans Arena on Wednesday night booed him off the stage. Revenge is best served on live national TV. And Trump, sat there sullen, stone-faced and jut-jowled with his equally unhappy-camper family — a higher stakes reprise of the public embarrassment heaped on him at the 2011 White House Correspondents’ Dinner. Cruz’s defiance catapulted the ragged, plagiarism-marred, poorly managed convention into nuclear dumpster fire territory. Moments before Trump’s vice-presidential running mate Mike Pence was preparing to deliver remarks that included the line, “This week, with this united party …” security escorted Cruz’s wife out of the arena for her own safety. Here are five takeaways from a night that furnished one of the most memorable moments in the annals of recent convention history. Frankly Donald, Ted didn’t give a damn. Cruz — who a few short months back vied to be the unlikely standard-bearer for the vanquished GOP establishment — taught Trump something party leaders on Capitol Hill have known since the Texas senator took office in 2013: He’s got a deep anti-authoritarian streak and relishes the opportunity to sledgehammer the best-laid plans of anyone who tells him what to do. More than anything, he seemed to get a kick out of having leverage, teasing the on-edge Trumps with language that skirted but never amounted to an endorsement, or even an especially convincing expression of confidence in the nominee’s campaign. “To those listening, please, don’t stay home in November. If you love our country and love your children as much as I know you do, stand and speak, and vote your conscience, vote for candidates up and down the ticket who you trust to defend our freedom and to be faithful to the Constitution,” Cruz said. For Hillary Clinton, a candidate who has struggled with crafting a concise message, the heavens instantly opened and rained bumper stickers. An hour or so later, Clinton tweeted “Vote your conscience” with a link to a voter registration page. Cruz rolls the dice. The Cruz campaign has never actually ceased to exist. Cruz (who raised a blockbuster $93 million for the primaries) has kept many senior staffers on the payroll and has commissioned a detailed post-mortem of his failed (if impressive) 2016 effort with an eye toward 2020. Everything Cruz says or does these days should be seen through the prism of the next election, not the current one, and in many ways, his Wednesday bombshell was the first salvo of his next war. But his decision to snub Trump so spectacularly is based on a somewhat risky assumption: Cruz, according to people close to the candidate, believes the reality-show nominee is a political lightning strike, a one-time phenomenon who captured the energy of the base but doesn’t respect the GOP base’s core conservatism, and that his more conventional, tea party approach will eventually come back into vogue when the orange fog dissipates. This is by no means a certainty, and Trump won in no small measure because he’s a much more entertaining and attractive candidate than Cruz, who is a magnet for unflattering memes, including the creepy Zodiac Killer joke. And beyond the possibility of a miscalculation lurks a risk that Cruz and his staff are keenly aware of: accusations, sure to be leveled by the Trump family if the GOP nominee loses, that Cruz abetted the election of the hated Hillary Clinton, which could snuff out his 2020 chances before the next campaign begins. It might be too late to heal the breach between the two men, but the smart money is still on an eventual Trump endorsement to avoid accusations that he’s a secret Democratic double agent. Huge stakes for Trump on Thursday. The wiry man in a checked shirt walking unnoticed and grinning among the tipsy Trump delegates and partiers in their floppy elephant hats was none other than David Plouffe, Barack Obama’s 2008 campaign manager, who was on talking-head patrol for the cable networks. Pence was good. Mike Pence gave a sturdy, endearing, impassioned and almost completely ignored post-prime-time speech. He was overshadowed by Cruz, but he won’t always be, and he deftly trod a fine line, presenting himself as aw-shucks decent, delegated to translate Gotham Trump into Midwest Nice (“He’s a man known for a large personality, a colorful style and lots of charisma. And so I guess he was just looking for some balance on the ticket,” he said) while attacking Clinton with the verve of the seasoned partisan he is. Donald Trump is presumptive nominee no more. 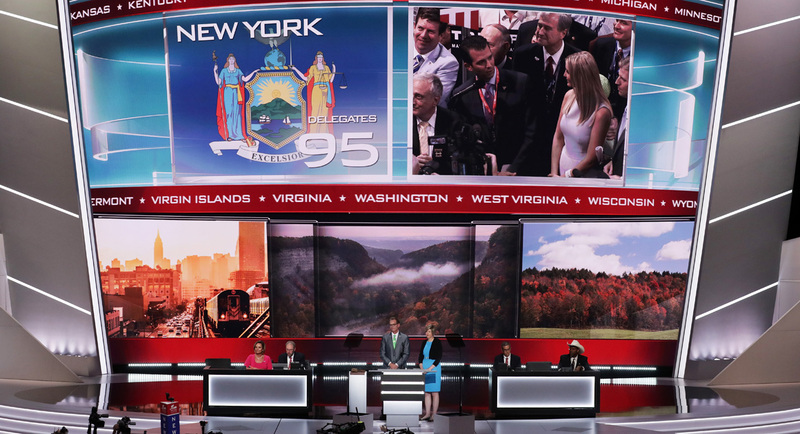 The New York delegation put Trump over the 1,237-delegate threshold necessary to claim the Republican Party's presidential nomination during a roll call vote on the floor of Cleveland's Quicken Loans Arena on Tuesday. Convention rules permitted the delegation from Trump's home state, which initially passed when called to announce its votes, to go out of order during the alphabetical roll call vote of states and territories. Donald Trump’s son, Donald Trump Jr., announced the 89 delegates from New York that the real estate mogul needed to clinch the nomination nearly an hour after voting began. Speaking to CNN’s Dana Bash moments later, Trump Jr. called it “one of the most surreal moments” of his life to nominate his father. The roll call vote proceeded relatively smoothly on Tuesday, despite some public opposition to Trump on the floor for the second consecutive day. Trump had been expected to cruise beyond the 1,237-delegate mark, but Republicans who oppose his candidacy had threatened to mount a final stand on the floor. The announcement of votes for Trump at times drew mixed reactions. While some delegates chanted and cheered for Trump enthusiastically, other delegates shouted in protest. Two Cruz delegates from Illinois shouted “liar” as the D.C. delegation was overruled. But as the voting kicked off, Trump found it exhilarating. House Speaker Paul Ryan, chair of the convention who reluctantly came around to supporting Trump as the Republican Party’s front-runner, commenced a roll call vote for the Republican Party’s presidential nominee at around 6:08 p.m. Tuesday. By a little past 7 p.m., Trump had officially claimed the nomination. In a last-ditch effort Tuesday, some frustrated delegates tried to rebuff convention rules and vote their conscience anyway. The move was intended to challenge the governor or party chair’s announcement of its state or territory’s votes, forcing them to poll their state or territory’s members. But the convention secretary ignored the dissent from delegates who weren’t recognized to speak for the delegation. The anti-Trump effort also fell short one day earlier after party leaders upended a faction of delegates’ move to hold a roll call vote to free delegates to vote their conscience instead of binding them to support a candidate based on the results of their states’ primaries and caucuses. The failed attempt and ensuing chaos, which played out on national TV, further illustrated the disarray inside a fractured party at what was supposed to be its unifying convention. Alabama Sen. Jeff Sessions, the first senator in Congress to back Trump, formally nominated Trump on Tuesday. “Mr. Speaker, it’s my distinct honor and great pleasure to nominate Donald J. Trump for the office of president of the United States of America,” Sessions said at the conclusion of his remarks. Sessions’ nomination was seconded by New York Rep. Chris Collins and South Carolina Lt. Gov. Henry McMaster — two early supporters of the billionaire’s campaign. Ryan emphasized before the roll call kicked off that delegates are required to “vote in accordance with their obligations” under convention and party rules, as well as state law. “Lastly, I wish to remind our delegates, our alternates and guests that maintaining order during the roll call is extremely important,” Ryan said, likely speaking directly to the anti-Trump crowd. The floundering so-called Never Trump faction was hopeful that Trump would enter the convention short of a majority of pledged delegates. Mitt Romney, the 2012 GOP nominee, at one point urged voters to support any candidate who had the best chance of beating the billionaire businessman in a given state. As the 17-person field dwindled down to three — Trump, Cruz and Ohio Gov. John Kasich — conservatives staked their hopes on the Texas firebrand’s operation, whose superior ground game kept alive aspirations that he could deny Trump the nomination on multiple ballots. But all anti-Trump efforts failed. The former reality TV star was declared the “presumptive nominee” by Republican National Committee Chairman Reince Priebus on May 3 following his decisive victory in Indiana, which ultimately vanquished Cruz and Kasich from the GOP primary. And he entered the convention with 1,543 delegates. Trump is expected to formally accept the nomination during his prime-time speech on Thursday. Hillary Clinton is maintaining a distinct advantage headed into the two national party conventions this month, according to three national polls out Sunday morning. The surveys, timed for release on the Sunday morning public-affairs programs, all show Clinton with a single-digit lead, from 4 to 7 points. An ABC News/Washington Post poll give Clinton a 4-point advantage among registered voters, 47 percent to 43 percent. Two percent of voters said they prefer another candidate, 6 percent would vote for neither Clinton nor Donald Trump, and 2 percent offered no opinion. That’s much closer than Clinton’s 12-point lead in June — though that was one of her best polls since both locked down their parties’ respective nominations. Clinton’s lead is larger in a CNN/ORC International poll: 7 points, 49 percent to 42 percent. Four percent volunteered that they would vote for another candidate, 4 percent wouldn’t vote for either candidate and 1 percent had no opinion. Has Hillary finally found her voice? The Racist Horrors of “Tarzan"